“It looks like a spider wearing a gimp-mask.” That was the verdict from one young, style-conscious female on seeing the Twike, an electric vehicle now available in the UK. It certainly does seem to have an unfortunate face, and an equally arresting profile: side on it looks as if it was styled by parking a glider on a level crossing. As well as divisive looks, and a name that will make owners sound like Jonathan Ross, the Twike also has a difficult price tag. 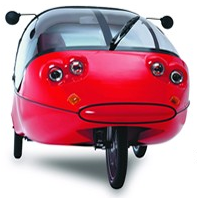 At £15,000 this three-wheeler costs about twice as much as GoinGreen’s popular pig-lookalike, the G-Wiz. Twike’s makers claim a maximum range of 90 miles per charge and a top speed of 53mph. The “optional pedal drive” that apparently “adds to the fun and fitness of the passengers” sounds a bit ominous, however.